In its forthcoming second season Daredevil is getting two new major characters: the Punisher (Jon Bernthal) and Elektra Natchios (Élodie Yung). Thanks to Entertainment Weekly, we now have a look at the Punisher in action. 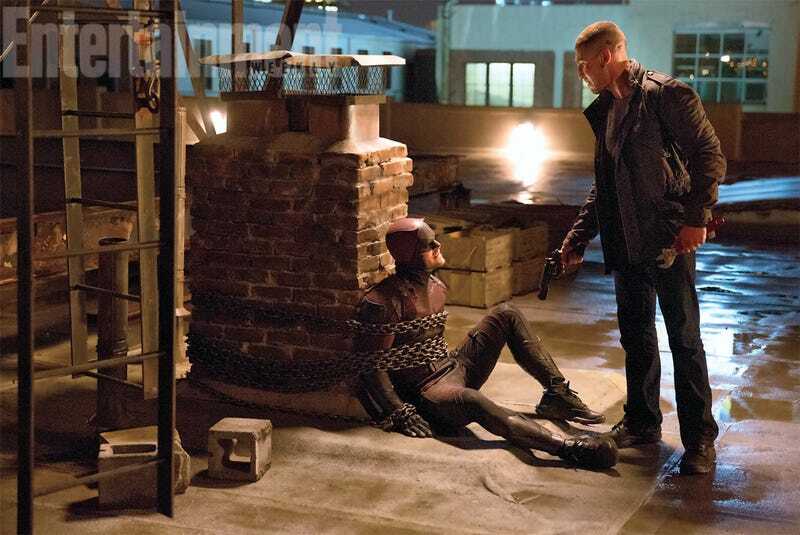 And it’s not looking good for Daredevil (Charlie Cox). He has a different moral code. Matt is a devout Catholic — and you rarely see a character who’s a devotee anything on TV. Frank has Hammurabi’s Code. It’s like letting a great white shark into the water. Matt’s a deeply moral complicated guy and she’s just the best bad girlfriend you can possibly have. She does everything wrong and attractive, she’s his id, the wild side. Matt is always taming his wild side. Elektra just lets it out. He’s both repulsed and deeply drawn to that. New characters, alright. Looks like Matt’s Catholic guilt is going to get a workout. UPDATE: Entertainment Weekly’s also released the first photo of Yung as Elektra, in which she is sadly not kicking the stuffing out of Matt.